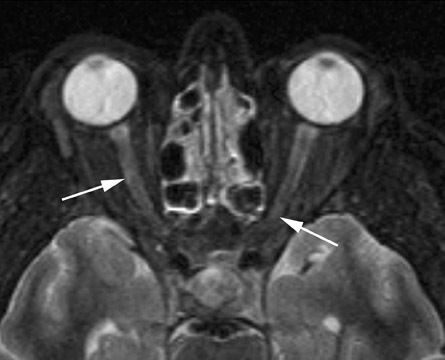 Dedicated imaging of the orbits with and without contrast administration (using fat-suppression techniques) revealed faint areas of increased signal on short tau inversion recovery (STIR) sequences and intense, patchy enhancement of both the optic nerves following contrast administration (Figures 1 and 2). The MR images of the head and the MR angiogram of the head revealed no additional abnormalities (not shown). Ischemic optic neuropathy is an uncommon complication of a variety of procedures including CABG, cholecystectomy, radical neck dissection,1 spinal fusion,2 endoscopic sinus surgery,3 and liposuction.4 Over a period of 14 years, the incidence of ION following cardiopulmonary bypass surgery increased from 0.1% to 1.3% in 1996.1,5 Following glaucoma, ION is the second most common optic neuropathy in adults.6 Shapira et al5 found that patients with ION after cardiopulmonary bypass had prolonged bypass times and lower hematocrits and also required high doses of inotropic drugs to maintain cardiac output. MR imaging of the brain and orbits is a useful tool in the evaluation of the patient with acute onset of visual loss following surgery. 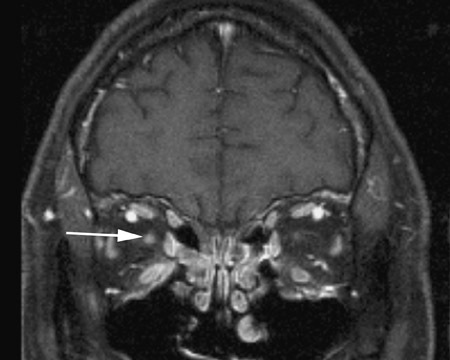 In our patient, MR imaging served as a conﬁrmatory test following the clinical diagnosis of ION and aided in the exclusion of other etiologies, such as multiple sclerosis or embolic infarcts. Vaphiades7 reported a case of optic nerve enhancement with ION following a hypotensive episode related to CABG, and our case corroborates these ﬁndings. In the Vaphiades7 case, the optic nerves continued to exhibit enhancement on a follow-up MR performed 16 weeks after surgery. Vaphiades’7 and our ﬁndings of optic nerve enhancement differ, however, from the bulk of reported literature regarding ION. 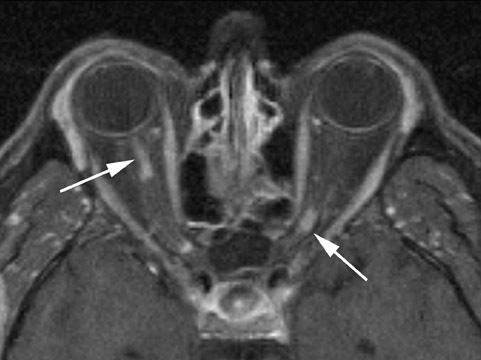 Rizzo et al8 compared the MR ﬁndings of ION with MR ﬁndings of optic neuritis in patients with multiple sclerosis and found that only 5 of 32 patients with clinical diagnoses of ION demonstrated MR abnormalities. It is unknown which, if any, of the patients in the Rizzo8 series developed ION postoperatively. In all 5 of the patients with MR abnormalities, increased signal was seen in the affected optic nerves on STIR sequences, while only 2 showed associated enhancement of the optic nerves.8 The MR technique and the time from symptom onset to MR evaluation is comparable in our case to those in Rizzo’s study.8 Our patient was imaged 2 weeks following the onset of symptoms, while the patients in Rizzo’s study were imaged an average of 22 days following symptom onset. The 2 patients in Rizzo’s study who exhibited optic nerve enhancement on MR were imaged within 14 days of symptom onset.8 Postulated theories for the etiology of optic nerve enhancement in ION include a demyelinating process or ischemic compromise of the blood-brain barrier. Ischemic optic neuropathy is a devastating but, fortunately, infrequent complication of various surgical procedures, particularly those characterized by hypotension and a loss of large volumes of blood. We present a patient with postoperative blindness secondary to posterior ION with MR ﬁndings of patchy enhancement of the optic nerves. While MR changes with ION is thought to be unusual, optic nerve enhancement with ION may be more common than previously suspected. It is important for radiologists to recognize the MR ﬁndings of ION, particularly when evaluating patients with postprocedure blindness. Remigio D, Wertenbaker C. Post-operative bilateral vision loss. Surv Ophthalmol. 2000;44:426-432. Dilger JA, Tetzlaff JE, Bell GR, et al. Ischemic optic neuropathy after spinal fusion. Can J Anaesth. 1998; 45(1):63-66. Lee JC, Chuo PI, Hsiung MW. Ischemic optic neuropathy after endoscopic sinus surgery: A case report. Eur Arch Otorhinolaryngology. 2003;260: 429-431. Minagar A, Schatz NJ, Glaser JS. Liposuction and ischemic optic neuropathy: Case report and review of literature. J Neurol Sci. 2000;181:132-136. Shapira OM, Kimmel WA, Lindsey PS, Shahian DM. Anterior ischemic optic neuropathy after open heart operations. Ann Thorac Surg. 1996;61:660-666. Moster ML. Visual loss after coronary artery bypass surgery. Surv Ophthalmol. 1998;42:453-457. Vaphiades MS. Optic nerve enhancement in hypotensive ischemic optic neuropathy. J Neuroophthalmol. 2004;24:235-236. Rizzo JF 3rd, Andreoli CM, Rabinov JD. Use of magnetic resonance imaging to differentiate optic neuritis and nonarteritic anterior ischemic optic neuropathy. Ophthalmology. 2002;109: 1679-1684. Ischemic optic neuropathy. Appl Radiol.